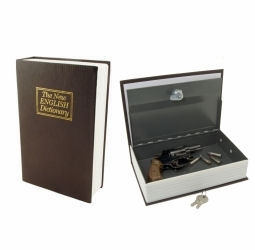 Get the double protection of disguise and a lock with this metal, key-locking book safe. Perfect for secret cash storage and hiding other valuable. The outside looks like a dictionary. Inside, you have lots of room to secure cash, jewelry and other valuables. A small automatic pistol will fit (ie Glock 19 and Beretta 84 will fit). You will be hard pressed to find a plain lock box for this price. Also available is a smaller model only 7 inches tall for $2 less.